Injustice #21 brings us the first strike in the ideological war between Superman and Batman that sets the stage for the world we see in the Injustice: Gods Among Us video game. We see Batman and the other heroes uncomfortable with a more proactive Justice League make their first strike, abducting Hawkgirl and replacing her with a duplicate in order to infiltrate Superman's ranks. The identity of the spy is still a secret but my guess is it's Black Canary - her future exposure as a spy in disguise is as good an explanation as any for her absence in the dark future/alternate reality of Injustice and there's some dramatic irony in having one bird-themed heroine replace another. Injustice #22 continues the argument seen in the previous issue, as we see further dissension in the ranks of Superman's team. Ironically, it is Lex Luthor - a good guy in this universe - who winds up thwarting Batman's plan to break the alliance by suggesting a public-relations stunt that will reassure the populace that The Justice League has their best interests at heart. You know the world is topsy-turvy when Lex Luthor is speaking in favor of placing humanity's fate in the hands of a few metahumans! What Tom Taylor has done with this title is truly miraculous. One might think it impossible to wring honest drama out of a series in which we already know the final outcome for most of the major players. We all know which of our favorite heroes and villains will or won't survive the journey from a somewhat familiar DC Universe to the twisted reality of the Injustice game. 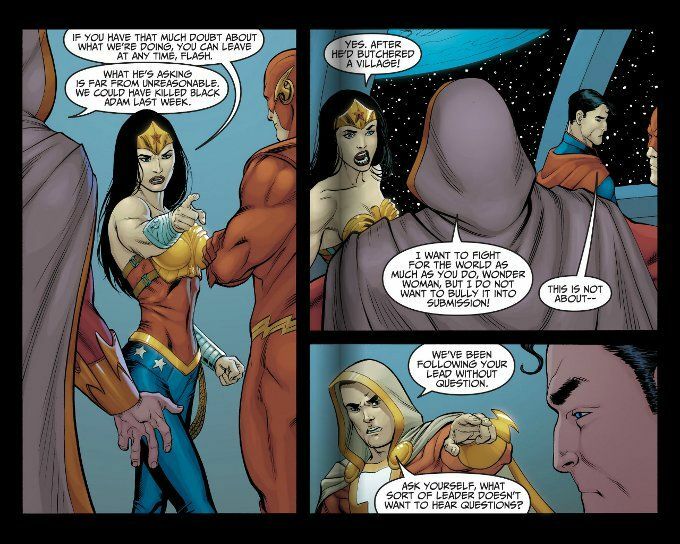 Yet Taylor does this by spinning stories within stories - such as Darkseid's response to Superman's actions in Injustice #22 - and giving us such wonderful character moments like when Wonder Woman deals with a camp full of female refugees being exploited by the soldiers who are meant to protect them. 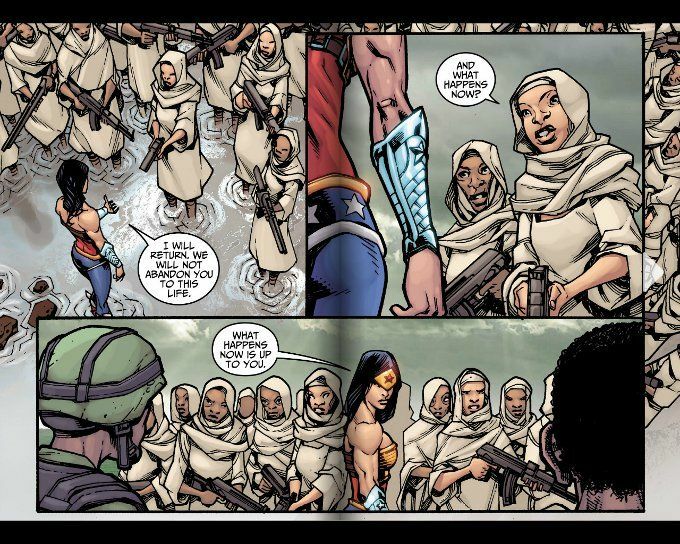 Though this scene was clearly inspired by a similar moment in Darwyn Cooke's New Frontier, Taylor makes the moment all the more powerful by showing us the actual moment Wonder Woman empowers a group of women to stand up for themselves rather than by having Wonder Woman tell Superman about the incident after the fact. The artwork on this series has been something of a mixed bag and these two issues illustrate the power an artist has in shaping a script. Neil Googe is a talented artist and I greatly enjoyed his previous work with Tom Taylor on Rose and Thorn. Yet Googe's stylized, big-eyed characters seem ill-suited for the more serious drama Taylor presents in Injustice #21. 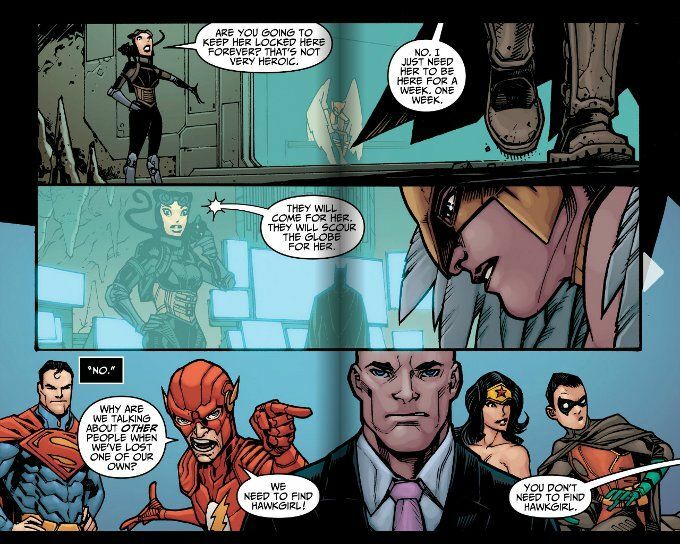 By contrast, Mike S. Miller - the artist on Injustice #22 - seems a perfect match for the darker tone of Taylor's story. 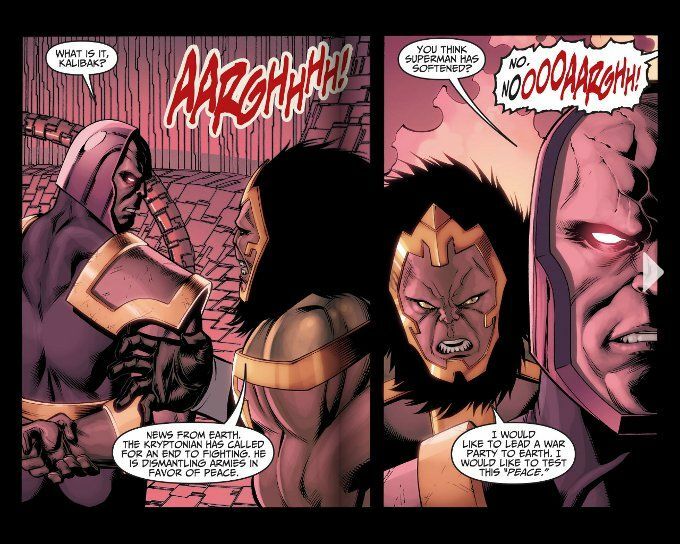 I particularly like his depiction of Darkseid and his general use of shadowing in the inks during the scenes on Apokolips. If you had told me months ago that I'd be reading a comic based on a video game on a regular basis, I would have laughed. Video game tie-in comics do not have a very respectable history. But Injustice: Gods Among Us bucks the trend and I dare say I'll be reading this book for a while yet.